This is the same as GrandView Cyber Electric Tab Tensioned 16:9 Home Cinema Projector Screen but with the benefit being that its designed to sit within your ceiling with a trap door that opens when the screen comes down for an incredibly discrete installation. Earn 1869 loyalty points when you order this item. 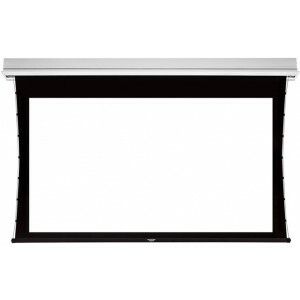 The GrandView Cyber In Ceiling tab tensioned 16:9 home cinema projector screen and uses the same quality material as the surface mount tab tensioned screens. The unusually quiet operation is due to the unique way that the motor section of the housing is separated from the ceiling section by a rubber seal. This stops any vibration travelling through into the ceiling void, an issue found with other In-ceiling designs. This along with the motorized trap door mechanism makes this screen the perfect discreet option for a projection based system. 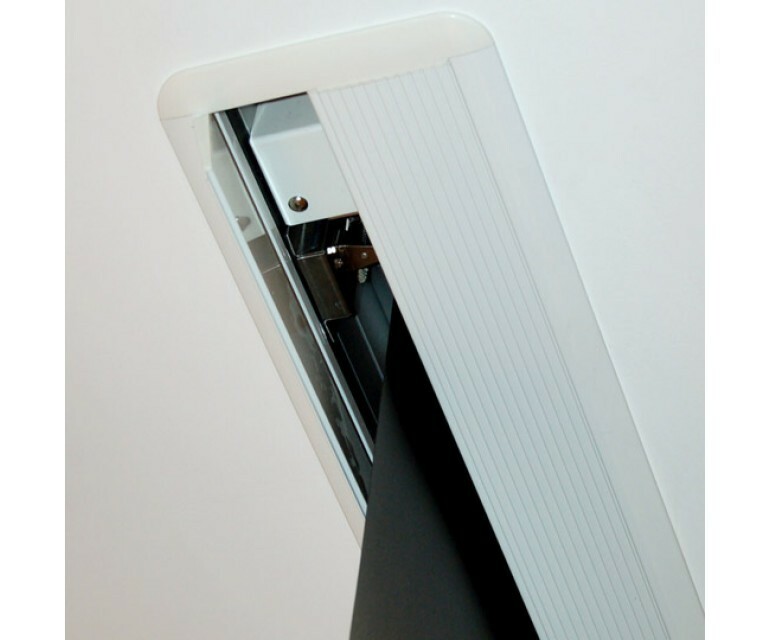 All Cyber In-ceiling screens feature built in infra-red remote control and come with a simple hand held remote. The included IR receiver is a small separate device that plugs into the internal interface and can be located on the ceiling or front wall by the screen. Also included is a 12volt trigger input, this allows the screen to be activated from any projector or surround sound amp with a 12volt output. Connection to the 12volt trigger of the screen is via a 2.5mm mini 2 pin jack. The aluminium diamond white case has an elegant curved profile making it one of the nicest looking screens on the market. The rigid sturdy design keeps the internal roller perfectly straight and any motor noise to a minimum. The Cyber series projector screens all use SOMFY motors found in other highly acclaimed cinema screens. 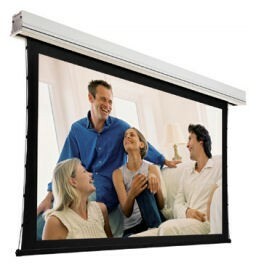 With a four layer structure comprising PVC and Fiberglass, the Projection screen material is tear resistant, fireproof, wrinkle proof and is designed to hang perfectly flat. The centre layer is a glass fibre net producing a flex rate of less than 1% compared with the industry average of 33%. The front layer optimises contrast and reflectivity while a black PVC backing prevents light leakage and helps retain a uniformly flat projection surface. 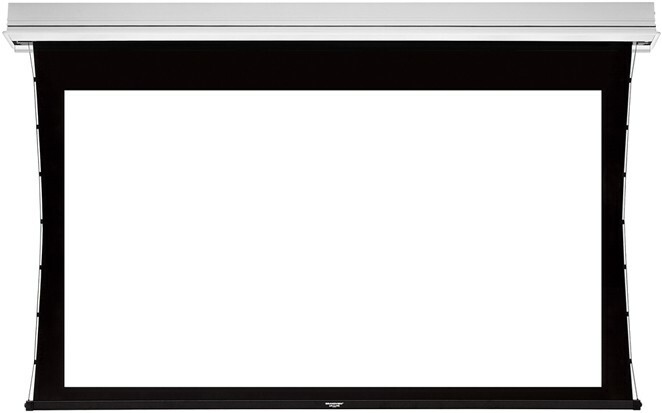 All In ceiling electric projector screens come with a large black border, which can be adjusted with the allen key supplied with the screen.